Last summer, The Washington Post published a controversial piece on the alleged "death of the electric guitar." The article claimed that the falling allure of the revered "guitar hero" trope is to blame, moving fewer young people to pick up the instrument without famous, virtuosic players like Jimmy Page, Pete Townshend, or Jimi Hendrix to aspire to. Many found this argument to be reductive and unfair. She Shreds' response even pointed out, in part, that the Post's claim of a dying industry was propped up by statistics surrounding brand-new guitar sales only, without accounting for the booming used instrument market or the significant increase—16 percent according to Music Trades— in effects pedal sales over the past decade. Though The Washington Post sourced its figures from big brands, and one in particular that has notably struggled as of late, it also quoted Fender's CEO Andy Mooney, who suggested that the claim of a dying industry is "greatly exaggerated." In recent years, Fender has argued before that the guitar market is stronger and more diverse than its critics suggest. Mooney told Forbes earlier in 2018 that Fender had conducted research that showed: 45 percent of new Fenders are sold to first-time players, 10 percent of those new players will be players for life, and 50 percent of new guitar buyers are female. Today, Fender has released more of the study's findings in support of its new online guitar learning platform, Fender Play. To get a sense of what the actual guitar-playing market in the United States and United Kingdom looks like, they partnered with the research firm Egg Strategy to interview 500 beginner and aspiring guitarists in a representative sample of the larger population. And what these results illustrate, cumulatively, is the changing, modern sensibility in guitar culture that its critics seem to miss. In addition to a selective presentation of sales figures, the Post's argument also operated on the assumption that everyone—or, at least, most people—interested in playing the guitar are also motivated by the desire to become a massive rock star. And though that definitely is the goal for some, according to this study, it doesn't apply to the majority. 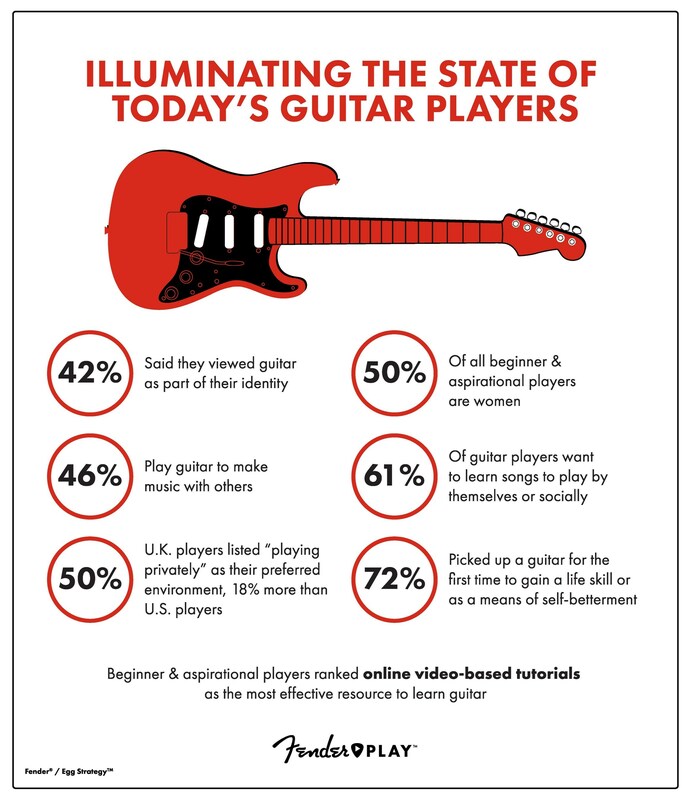 Well over half of all respondents (72 percent) began learning guitar based on intrinsic motivations—"to gain a life skill or as a means of self-betterment"—and 61 percent cited humble aspirations, like learning their favorite songs to perform for friends and family, over a desire for grand-scale fame and fortune. Half of the guitar players surveyed in the U.K. even said that they preferred playing privately (to the U.S.'s 32 percent), which makes sense based on the well-documented therapeutic benefits of playing an instrument, especially on mental health. Daniel Levitin—an award-winning neuroscientist, musician, record producer, and author who Fender consulted for the study—substantiated that, "Letting your mind wander is the key to reducing anxiety. We get our minds to wander by walking in nature or playing music—that's what hits the reset button on the brain. Even just 15 minutes of 'wandering' and playing an instrument can increase productivity." Fender's study not only presents a market of players that is very much alive and well, but one that has also gotten increasingly more diverse in its makeup. The study found that 50 percent of all beginner and aspirational guitar players identify as women, 19 percent of aspirational players are African-American, and 25 percent of beginners are Latino/a. About the results, Mooney pointed to some of the mainstream artists helping to redefine the industry's landscape. "Today’s players have grown up in a different cultural context and popular music landscape, and rising artists like Mura Masa, Tash Sultana, Youngr, Daniel Caesar, Grimes, and Ed Sheeran are changing the way guitar is being used." Part of that modern cultural context is in today's digital advancements. With the relatively recent advent of streaming and sharing platforms, the process of creating, sharing, and consuming music is easier and more accessible than it has ever been for musicians at all levels. In all, rather than proving that the guitar industry is dead or dying without a new wave of old-school "guitar heroes" for young players to aspire to, it paints the picture of a new market of excited guitar players that has evolved into something else—something younger, more diverse, and with a different, more modern definition of what it means to be a "guitar god."